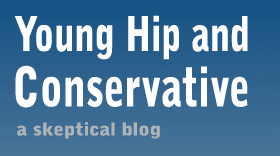 Young, Hip and Conservative: a skeptical blog: What's wrong with politicizing a tragedy? I haven't written about the Aurora shooting before, although I've been tempted to write about how stupid it is to ask people involved in making the Batman what they think about the shooting. Yahoo News thought it important to tell us that they were shocked. A different reporter revealed that Gabrielle Giffords did not support the shooting either. Uninspired reaction stories aside, some members of the left are using the shooting for momentum so they can bring out gun control proposals they already supported before the shooting. This has drawn some criticism as "politicizing" the tragedy, but I can't find a convincing argument for why that should be off-limits. When a judge overrules a piece of legislation, critics will say they are legislating from the bench and supporters will say they are simply righting a wrong. With that same duality of perspective in mind, gun control can be viewed as a short-sighted, foolish policy or a life-saving measure, depending on the viewer. I reject most of the gun control arguments I've heard after this shooting, such as Lawrence O'Donnell's ridiculous suggestion that limiting rifle magazines to 10 rounds would have led to the unarmed crowd overwhelming the shooter. That being said, I can completely understand why they would want to use this tragedy as a spring board to talking about their side of the issue. From the gun control advocates perspective, America would be a safer place if guns were harder to obtain legally. They think tragedies like this are examples of the terrible events that could be stopped with tighter controls, and now is the perfect time to win public support. In the movie Braveheart, I don't recall the Scots allowing a period of mourning for William Wallace before they returned to war with the British. Instead, they used his death to invigorate their troops, and that's what gun control advocates are trying to do here. I don't like that they will end up making a lot of rushed emotional arguments instead of letting cooler heads prevail, but this is as good a time as any for my intellectual opponents to make their play. Let us have it. The best-known tragedies are by default political because they have indirect social or economic consequences which change how people relate to one another. Events don't exist in isolation. If we want to *prevent* tragedies like that from occurring in the future, it has to be politicized. There's no other way around it. But that doesn't mean we have to disagree on solutions to these issues, as the article you cited seems to imply. Preventative solutions come through talking about the problem civilly. People seem to reject politicizing issues because it's "partisan". But no one disagrees that the tragedy could have been prevented. Where you place that burden is the issue. I wonder how it could be 'partisan' if those differences existed beforehand, and not without good reason. It's just rhetoric. I think there is something in the idea that you shouldn't use these kinds of things just to promote your political cause. But I think these sorts of tragedies as much spur people to make their arguments as they provide them with a case to base their arguments on, and accusing other people of politicizing a tragedy can be just as cynical as politicizing it in the first place. Honestly, this gun-control debate is such a stale-mate, and you have to endorse so many hypotheticals to make your case on either side, that I can't support it either way. I am concerned about the number of shootings and so forth. It just seems like there have been so many in the past year, and I can't believe it's just because they're so blown out of proportion. If there were people fighting for money or even liberals and conservatives gunning each other down in the streets, that would be comprehensible -- but that people in America just go and shoot innocent bystanders for no reason, and that they do it more and more is alarming and befuddling. Even suicide bombings make more sense than this.